The State Transport Company (STC), which used to stand out among other transport companies for safety, comfort and reliability, has failed in recent times to hold on to those qualities. Having enjoyed monopoly for some years, without any major competitor, the reliable state transport has not been able to live up to its expectations due to the use of 'second hand' and obsolete buses to the detriment of passengers who pay with their hard earned money. Some of the regular passengers of STC told ADM that services being delivered by the company for some years now is sub standard and that has caused most of them to reconsider boarding ordinary buses which ply the same route since the difference is not much. 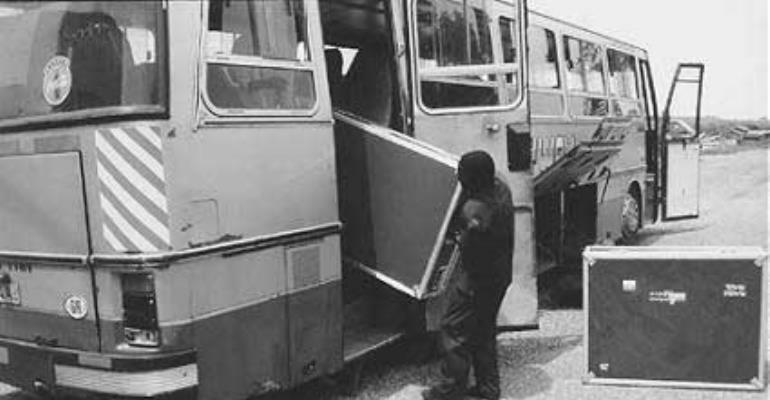 The people recounted the days when STC was at its peak and said, "they are now operating with more second hand and old buses with very few new ones, causing inconveniences to passengers." On Tuesday some passengers who were on board in an Accra bound STC 58-seater bus from Takoradi, told ADM how they were abandoned at the roadside when the bus they were travelling with developed a mechanical fault, about a quarter way through their journey. The people also expressed some discomforts they had in the bus. They complained about lack of spaces between seats, lack of any source of entertainment: there was neither radio system nor television in the bus. The air conditioners were not working, both the outside and inside of the bus were dirty and even the lights in the bus appeared so dim that people could hardly see things around them and worst of all, most of the seats were torn. The bus, which was supposed to arrive in Accra at 9 am, departed from Takoradi at 5:30am instead of 5.00am, and as if starting off late was not enough, The Fiat bus with registration number GR 7417 U that was overhauled on 14th March 2004 developed a fault on the way, as one of its ejection pipes broke. It happened around 6:35 am at Sunkwa near Atabadzi in the Central Region. The driver, Mr. John Teye Kwafo, told the passengers he had to make a call at the nearby village to the STC offices at Takoradi to arrange for a new bus. It was later learnt that he had boarded another STC bus for Takoradi to bring a mechanical engineer to work on the car, without formally informing the passengers who were by then stranded by the roadside. The driver then left the vehicle's engine to the mercy of some fitters as passengers kept waiting. By the time the engine was fixed for the journey to continue, it was about 8:40 am and almost half of the passengers had left in private and commercials vehicles at their own expenses. After waiting for almost two hours for the fitters to finish work on the car, the driver was no where to be found. When this reporter tried to inquire further into the cause of the emission of smoke into the bus, the driver refused to comment but rather retorted "what do you know about mechanics? We are not joking here." Despite the time it wasted on the way, the bus made a stop over at Cape Coast to fill in some of the vacant spaces left in the bus. Below are some of the views expressed by some of the passengers ADM talked to. To one Attah-Kwei, "Inefficiency and bad management have rocked STC. The services are very low in standard compared to the previous years, they have a problem with time and I think this bus in particular was a gift, because it is not suitable for long journeys, they should give us the best and we would pay for it. I would suggest that the whole process is hauled and changed. The management knew this bus had a problem but they decided to give it to us, I think they have enjoyed monopoly for too long, its time KTS and others give them some competition" Joseph Abor said "STC's services are not reliable and dependable now. This is neither the first nor the second time I have experienced this with STC but the management condone and don't work on it. Last Saturday the same thing happened and for over two hours the people became stranded because the driver had gone to find another bus. Some managed to board different cars and what about those who don't have extra money? With STC if it is not this problem, it's that one. Either their engineers are not good enough or it's a management problem. This is probably because there is no competitor around. When it comes to time they are just irresponsible. I think the managers should start taking good decisions". One woman called Beatrice Frans said "When STC gets stuck somewhere, one has to wait for hours before we get help. The drivers should be provided with mobile phones so that they can get to their offices quickly when there is a problem. Additionally when passengers continue their journeys by their own means, they don't refund the money, passengers complain but all fall on death ears. STC always causes inconveniences but would continue with their adverts that their services are reliable and the best. We are not fooled. They better give us our money's worth or be prepared to lose their customers to other companies."